My name is Jules Clancy. I’m a former food scientist turned cookbook author and vegetable lover. I only write recipes with 6-Ingredients or less and I’ve been blogging since 2005. I’m on a mission to help make your cooking EASIER. Because I know that by keeping things simple, weeknight dinners need not take loads of energy or time. Because I believe cooking and eating are two of lifes great pleasures. Because I believe cooking for yourself is one of the best things you can do for your own health and well being. Plus home cooking is so much fun! 1. I am terrified of snakes. But have somehow ended up living in an area with a large population of deadly (and aggressive) tiger snakes. I tell myself that ‘if it doesn’t kill you it makes you stronger’, but I still scream and run away whenever I see one. 2. I live in a beautiful part of rural Australia with my Irish husband and our two young sons. We’re between Sydney and Canberra and I feel blessed every day that we get to wake up among the gum trees, birds and kangaroos. The men in my life feel blessed we have plenty of space to grow our own spuds and play music as loud as we like. 3. I don’t believe in diets or counting calories. Because they take the pleasure out of food AND they teach you to ignore your internal satiety cues. AND for most people they don’t work in the long term. I believe it’s much more effective to focus on building healthy habits around eating well and being active. 4. I have PCOS and Type II Diabetes. So in spite of what I said above I do (mostly) restrict my own eating to low carb / healthy fat (LCHF) to keep my blood sugar under control. It also makes me feel especially blessed to have conceived my boys naturally in my early 40s. 5. I created the White Tim Tam. The full story is that I have a degree in Food Science. My early career was in product development for large food companies like Kellogg and Campbells who own Arnotts – the largest biscuit manufacturer in Australia. If you’re not familiar, Tim Tams are an iconic Australian chocolate biscuit (cookie) and definitely not diabetic-friendly! 6. I’m addicted to home made mayo and eat it most days. Sometimes for every meal! I also love peanut butter, salad greens (a meal isn’t a meal without something green), stinky cheese, mushrooms, asparagus, butter, beets, kale, lentils, steak tartare, a good roast chook, poached eggs, chickpeas, dark chocolate and double cream. 7. I have a ‘thing’ for bacteria and yeasts. So I love making my own fermented foods like yoghurt and sauerkraut. When I was studying food science my honours thesis was in food microbiology looking at the bacterial populations of Blue Vein and Camembert cheese – any excuse to eat more cheese! 8. I have 2 science degrees (food science and wine science). I had a brilliant time working all over the world making wine including France, California and Australia. I also learned one important lesson, making wine is hard, hard work. It’s much better to just pay someone else to make it so I can focus on the drinking part! 9. I HATE when people ask me what my last meal would be. Mostly because I don’t like thinking about not being able to eat any more and also because it’s so tough to decide! That being said, I would love my last meal to start with champagne and oysters. And possibly end with blue cheese and Château d’Yquem (dessert wine). 10. I enjoy food styling and photography and take pretty much all the photos for Stonesoup. However I’m terrible at photographing people, especially myself. 11. When asked for my ‘occupation’ on forms I usually write ‘author’ because (a.) I actually am a published author and have also written several eCookbooks. And (b) it’s much easier than having to explain the whole blogger / online cooking school creator / meal planner thing. 12. I’ve eaten at some of the best restaurants in the world including el bulli (before it closed), Noma in Copenhagen and el celler de can roca. We pretty much always plan our holidays around a restaurant reservation. Although these days with our small family that tends to be more casual day time places. 13. I have dreams of growing most of our own food. But have a very long way to go. At the moment I’m happy keeping up the supply of fresh herbs, salad greens and eggs from our chooks. 14. Did I mention how much I LOVE LOVE LOVE food? Oh, you get the picture. Good! Or you can read my whole story over HERE. 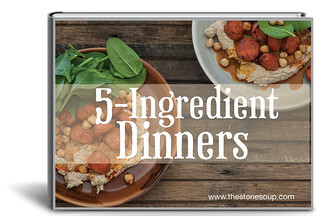 Enter your email below to get your FREE ‘5-Ingredient Dinners‘ eCookbook including the 25 best easy recipes as voted by Stonesoup readers… It’s FREE!